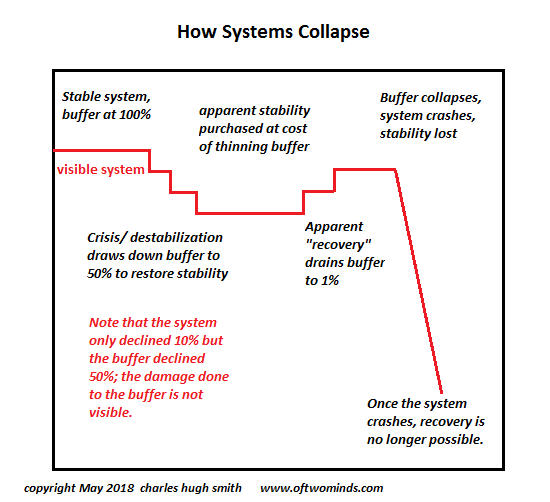 Charles Hugh Smith writes excellent pieces on true macro level economic thought, and here he touches on a fatal flaw of the monetary system. With nothing of any tangible value backing up ink-on-paper currency, the only thing that gives it any temporary value is the faith it will can be used again in a similar transaction. It doesn’t say on a bill that it is money. It says is “legal tender, for all debts public and private.” It is debt, usually used to pay for other debts, incurred by work or investment. But if you try to exchange that piece of paper with the government, the only thing you can get back is more paper, that represents more debt, in the form of treasuries, etc. It’s a shell game, a mirage. Gold is the exception. The buck needs to keep changing hands to have any value at all; the buck literally can’t stop anywhere for good and end up worth anything. Because its real value is constantly heading toward zero over time. When faith is lost that these pieces of paper will be accepted in the world at large for such debts, they become pieces of printed picture art and nothing more. Because while dollars are inarguably legal tender for debt, they can be exchange for nothing more than faith…faith that gets diluted every time the Fed adds to the already astronomical, un-repayable debt it has already incurred. Faith that is not, contrary to popular belief, in unlimited supply.